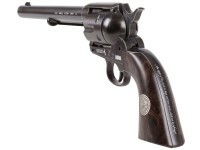 Take hold of a gun that won the West with this 7.5” CO2 Pellet Peacemaker! 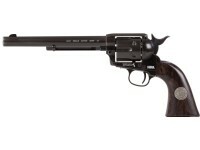 Umarex teamed up with the NRA to produce this special edition replica air pistol of the gun that won the lands west of the Mississippi. With a rugged flat black and weathered finish, the authentic feel and heft of this replica are apparent right out of the box. 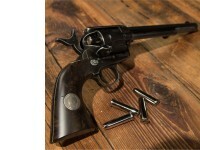 Its single-action firing is smooth and its functions are historically accurate as well as satisfying. 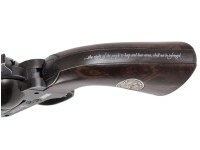 A dark mock wood grip is emblazoned with the symbol of the NRA—an eagle clutching crossed rifles. Across the back of the handle is inscribed “…the right of the people to keep and bear arms, shall not be infringed.” A phrase that the NRA has taken to heart for over 100 years. As beautiful to shoot as it is to look at, load up the 6 included pellet shot shells to send them flying at speeds up to 380 fps—perfect for backyard plinking sessions with soda cans, balloons, or whatever you want! 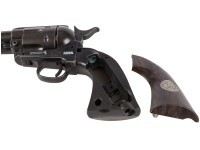 Since this is single-action, you will be cocking the hammer ever shot! If you’re a lover of historic arms and want to own a piece of it, this NRA Peacemaker may just be its definitive edition. 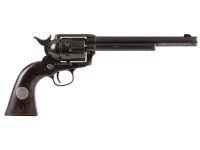 Things I liked: Accuracy and handling is really nice for a revolver of its size and weight. Love the NRA/Colt markings and 2nd Amendment quote on the back strap. Things I would have changed: I could tell the antiqued finish was accented with fine steel wool and was a bit sloppy throughout. I used gun blue to even out the finish and it looks much better (smoother and softer) and authentic in my opinion. 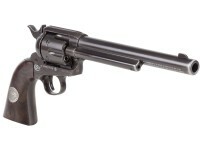 What others should know: I've noticed that these 7.5 inch barrel Peacemakers have a bit of play (or movement) in them where they are anchored into the cylinder assembly, however this has not adversely affected the accuracy of the revolver. They shoot spot on from ten yards out. Overall an excellent piece of history for the money. Things I liked: The fit and finish are sweet; I bought this model instead of the 5-1/2" barreled one as all the reviews said the longer barrel was more accurate; it IS accurate, and it shoots to point-of-aim. Plus, it's a piece of history...love it! Things I would have changed: I don't need the safety, so I just leave it off. 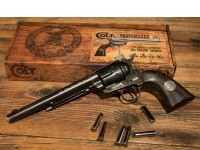 Does anyone know if this Colt NRA pistol will take Dan Wesson 715 cartridges? Yes it most certainly will, and the bb shells as well. 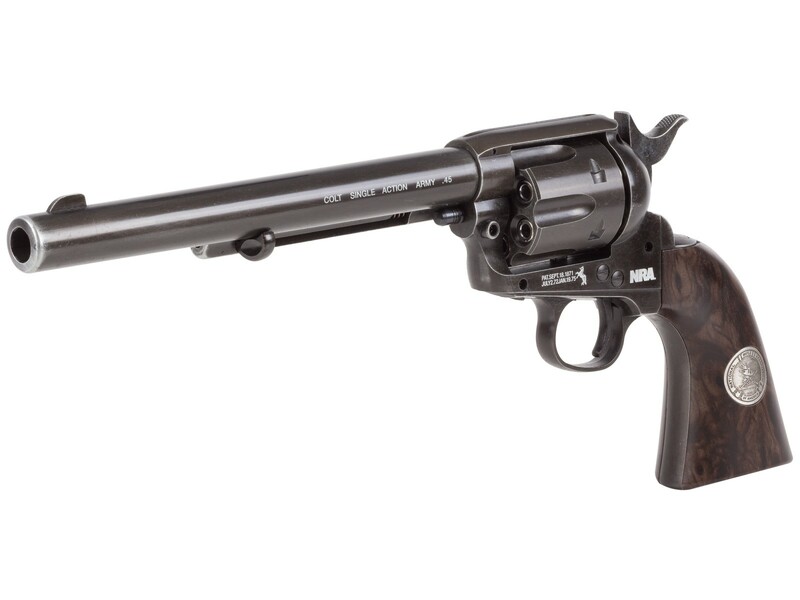 It will use the Dan Wesson, the wingun, and the bear river shells. curious, i know this is a pellet revolver, but would it still be efficient shooting .177 bbs? NO, THE PELLET BARREL HAS RIFLING FOR ACCURACY, BBs WILL RUIN THE RIFLING. BUT YOU CAN SHOOT PELLETS IN A BB GUN, WITHOUT HARM. THATS WHY THE NRA PEACEMAKER COMES WITH SILVER BULLETS INSTEAD OF BRASS BULLETS, TO KEEP FROM MIXING BBs WITH PELLETS. THE SHELL AND SEAL I BELIEVE ARE THE SAME SIZE, BUT GO BY THE INSTRUCTIONS AND USE THE CORRECT PART. I meant as another offering. Apparently on Europe they have morefinish options, such as bright blue. If you like this offering fine, but I have enough weathered finish Peacemakers. 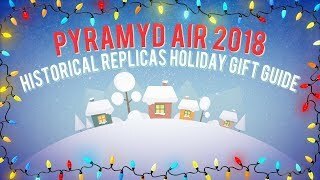 THEY ARE VERY NICE THE WAY THEY ARE, I HAVE ONE. THE NRA LIMITED EDITION, ONLY COMES ONE WAY.